Physical Activity is cognitive candy! Clinical Neuropsychologist Dr. Antonietta Russo suggested I read a book called Brain Rules: 12 Principles for Surviving and Thriving at Work, Home, and School by John Medina. RULE #1: Exercise. Medina calls physical activity "cognitive candy." I'm positive that exercise has had a tremendous effect on my recovery (even now, 13 years post-injury). EXAMPLE: I have a video of myself talking to a nurse just one month after injury and I can barely speak clearly, my thoughts get lost mid-sentence. It's horribly sad to watch. Even more sad than this is that ten years later, although I was much, much more coherent when speaking, I was still getting lost mid-sentence (although not quite as often). But since I began regular exercise at the gym (a mix of cardio, yoga, weight-lifting) I feel more alert, more cognitively in-tact and HAPPIER (the best part). Was my Inner Ear damaged??? There are three parts of the human ear (inner, middle, and outer). The outer ear is the part that you see on your body (the part that that's connected to the earrings I'm wearing) - the middle ear is the part that hears - and the inner ear is responsible for the sensations of balance and motion. It's safe to assume that my inner ear was damaged in the car accident but my mom doesn't remember and too many years have passed to look at the medical records (I still have some records but none say anything about inner ear). The occupational therapist who spoke to the group asked if any one of us experiences dizziness. Personally, I think of dizziness as "a feeling of head spinning for an extended period of time." At first I didn't raise my hand because I don't experience this "continual spinning feeling." But I do feel as if I'm playing catch-up when I turn my head quickly from side-to-side or up-down. It's a brief head-spinning/ache feeling. I assumed this was simply because my brain was hurt, but after tonight, I think it's that my inner ear was damaged. Unfortunately, damage to the inner ear can never be completely repaired. But you can adapt. I remember my head constantly spinning when I was first discharged from the hospital. But over time (13 years!) I've adapted and strengthen my inner ear by challenging my balance through exercise. The beauty of a power nap! Edgar Watson Howe once said, "the feeling of sleepiness when you are not in bed, and can't get there, is the meanest feeling in the world." I already talked about this on another blog but I'll say it again, the sleep disorder is definitely the cruelest part of TBI. I'm not tired so I can't sleep. I'm too tired so I can't sleep. What's the difference? I've really learned the beauty of a power nap since my injury. Sometimes I rest my eyes for as little as one minute in the oddest places (the toilet, the elevator, the car - when someone else is driving of course). But these rest breaks help me get through the day and help me make it through moments where I long for my bed but can't get there. The Human Brain - my frontal lobe was the most damaged. 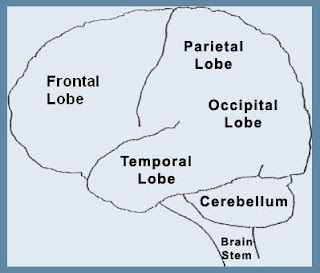 The frontal lobes are involved in motor function, problem solving, spontaneity, memory, language, initiation, judgement, and impulse control. The frontal lobes are extremely vulnerable to injury due to their location at the front of the cranium, proximity to the sphenoid wing and their large size. Did you know TBI is the "signature wound" of Iraq War? I really empathize with soldiers returning from Iraq because many of them unknowingly suffer from TBI. Symptoms of post-traumatic stress disorder, or PTSD, are similar to TBI symptoms (irritability, trouble sleeping, dizziness etc) so soldiers can be misdiagnosed. "Diagnosing TBI is imprecise — damage rarely shows up on CAT scans or other tests. Treating it is a crapshoot, because little is known about the brain injuries from blasts in Iraq versus the ones from falls and car crashes that doctors are used to seeing". I just returned from a beautiful but short hike (90 or so min?). When I first moved to Utah, I hiked with some friends a few times in the evening (7 pmish). Yes it was great to be outside but I felt extremely tired and withdrawn during these hikes. I rarely smiled. I always struggled to balance myself and not tip over. How can this be fun? I thought. Hiking in UT strains my balance, my vision, and all five of my senses. At least it did when I hiked in the evenings. But I've discovered that with a brain injury, anything challenging or stressful should be done in the morning. So in order for me to smile while hiking, I joined a morning hiking group!!! I am totally alert and rarely worry about tumbling over during these hikes because my brain doesn't feel disconnected in the morning. I now actually feel connected with the UT mountains (cheezy statement I know). But I "get it" - I "get" why people love skiing, hiking, camping so much (okay maybe not so much the camping but the rest I "get it"). . . .the practice continues. . . So I returned from Mexico last night. Yes it was fun and no I didn't get very tan. I think I look like an American Flag - red (skin burn) and white (skin untouched by the sun) stripes. It's actually kind of funny! Just like I promised myself, I practiced CROW POSE everyday. I improved my balance by one second. I used to be able to balance in this Yoga pose for one second and now I can do it for two seconds. So I'm giving myself another week of daily CROW POSE practice. Today I did a wonderful Yoga class! I'm so happy because my instructor Denise said, "Jennifer you are doing so well . . . I can't believe how flexible you've become since you first began practicing Yoga!" She's right - my flexibility has improved considerably. I feel much more open and limber in the last year or so that I've practiced Yoga. More importantly for me, my balance has also improved (balance is a problem for most brain injury survivors). I still can't do Crow/Crane Pose for more than one second. It's not that big of a deal I guess because if you look at the below link, you'll see that Crow Pose is not an easy balance pose. But it still bugs me that I can't do it! Denise told our class that if we practice Crow Pose everyday for one week, we'll be able to do it. So I promise to be a Crow for a few minutes everyday this week. I WILL PRACTICE - even in Mexico. Which by the way, is another important detail of my life. . . I leave for Mexico tomorrow! I'll be sure to blog when I get back. 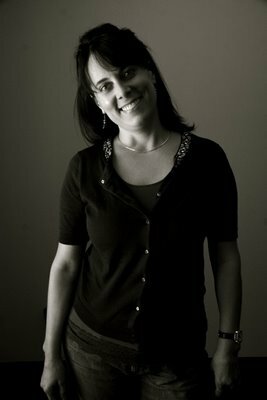 WEBSITE: Today I purchased my own domain: http://www.jennifermosher.com/ ~ I still need to build my website and I'm not sure how to do it. Actually, "not sure" is probably not the right expression because I have NO idea how to do it but I'll find a way. I want to link this blog to my website and then sell my book on the website (first I find a publisher). My goal is to have the website up by August. So check back if you are interested. WORKOUTS: Tomorrow I am going to post my TBI fitness philosophy: all TBI survivors should consistently practice routine exercise (i.e long walk everyday, fitness classes at the gym etc). I try to be religious about my workouts. It gives me something to focus on and I feel so much better: MENTALLY, PHYSICALLY, and EMOTIONALLY - not just a little better, but a lot better! I need to workout in the morning and not the evening. I sleep horribly if I exercise after 5 pm. Once my dad told me that he slept better after a late night workout because he was so tired. This is only partially the same for me - I am also so tired after a late night workout but I do not sleep better. A couple years ago I was exercising in the evening because it was the only time I had available, but I attended a class at the BIAU(Brain Injury Assocation of Utah) yearly conference and the speaker warned us against late night workouts so I changed my schedule - bottom line, I am sleeping better now that I workout in the morning or early afternoon (in addition to some other sleep hygiene tricks which I will blog about another time). So you may think that I posted most everything about my TBI fitness philosophy, but oh no there is more to come tomorrow - I'll even try to post a photo of my favorite workout (one of them). In a large bowl cream together sugars and applesauce. Add eggs and vanilla and beat well. Sift dry ingredients into a separate bowl. Add to mixture. Fold in oats, cereal, and chocolate chips. Drop by tablespoon onto a greased baking sheet. Bake 350 degrees for 10-12 minutes until very lightly browned. Makes six dozen. The WORST part of TBI . . . Hands down, the worst consequence of a Traumatic Brain Injury (for me at least) is the sleep disorder (yeah it's more than 2 hours since I said I was off to bed and I cannot fall asleep). UGH! Good thing it's Sunday tomorrow and I have late church. Over the years, I've learned a lot about how to manage my sleep disorder. I did everything wrong tonight - which is why I can't sleep. 1. Pick a bedtime and do not deviate from it (my bedtime is 10 pm and I hit the pillow at 12:30 am). 2. Do not eat much late at night (especially dark chocolate which I did). 3. Be diligent about an exercise program (but do it in morning NOT less than 3-4 hours before your established bedtime). i.e I went to the gym at 9 pm - bad move for a restful sleep. I'm usually really good about practicing good sleep hygiene but tonight was an exception. Darn that dark chocolate (I made a great cookie recipe which I found in The Essential Mormon Cookbook. Surprisingly, the cookies were pretty good! One way I manage my TBI is by making myself into a bit of a health food guru. So I doctored up the recipe to make them more healthy--if that can be said about cookies). I'll post the recipe later. Hopefully now that I've done something else besides unsuccessfully force myself to fall asleep, maybe I really will sleep? Oh yeah I practice Yoga where I learned some breathing techniques. These help me fall asleep (if I don't eat dark chocolate, that is). Try it! Try this for a few times and next thing you know you'll be fast asleep. Sweet dreams! I can see why some people become addicted to blogging. Way past my bedtime now and I will pay for this tomorrow with droopy eyes! Good night friends. 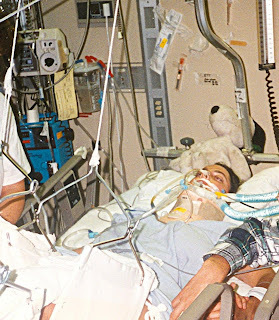 This is me in the hospital one week after the car accident. The conference was at Cedar Fort, Inc. in Springville, Utah. It was wonderful and so helpful to my own writing. I've written a personal memoir about my struggle with Traumatic Brain Injury (TBI) after I was severely injured in a car accident. I broke my neck in two places and fractured both femur bones. Oh and four toes but that is inconsequential when you're lying motionless and comatose in a hosital bed. Few people know of my injuries -besides those I've told or those who knew me before. I really want to publish my book in hopes it will help other TBI survivors. Anyway, the Aquisitions Editor at Cedar Fort asked me, "Do you have a website?" huh? I thought, of course I don't have a website . . . but everyone blogs now so I am going to "join the club" and start with a blog. Who's the audience for this blog? um . . . not sure yet. Hopefully friends and family to start (I'm sure my mom will be an avid reader) but eventually I want to direct it to other TBI survivors. There are other survivor blogs out there but we'll see what I can do and hopefully market my memoir (once it's published). ONE MORE THING: the title of this blog is also the title of my unpublished memoir. . . read next post for how I came up with this title.